NEW BLOKES NIGHT: Thursday 27th November 2014. Come and join us! are all part of it too. here's MAN CHOIR singing Elesa, a traditional Georgian work song. Find more videos of us performing here. MAN CHOIR is Oxford's Men's Community Choir. It's open to everyone: no auditions, no need to read music - everything's taught by ear. Enjoying ourselves, performing and getting to know other people are a central part of what we do, too. MAN CHOIR starts again on Thursday, 9th January, at our new venue, the Friends' Meeting House on St. Giles - read more. There will be no MAN CHOIR on Thursday, 31st October. 18.10 Three performances scheduled for this term We're taking part in charity concerts with Vox Steady (16th Nov), Jericho Singers (9th December) and MIND (14th December). Term starts again tonight, Thursday 12th September. No MAN CHOIR 4th and 11th April. Restarting 18th April. Much joy at MAN CHOIR towers this week as your charming and illustrious leader, Philip, has been officially summonsed for the whole Spooky Men's Chorale 2013 UK tour. 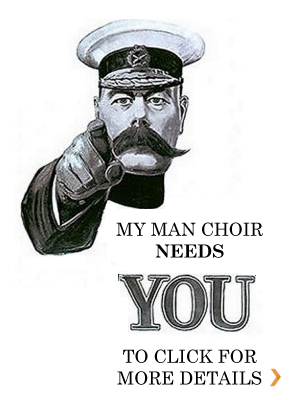 SIgn up to MAN CHOIR's newsletter to keep in touch with what's happening.